First released in 2011, this massive volume on illustration history sold out almost instantly. Now the book is back in print! A whopping 432 pages, 6.5 pounds, sized 9x12 inches, hardcover with dustjacket. The retail price is $60.00 plus postage. A modern classic, if you are a fan of illustration art history, this book is an essential additon to your library. Shannon Stirnweis has had a long and varied career, producing illustrations for men's adventure magazines, and slick magazines such as Argosy, Field & Stream, Reader's Digest, Popular Mechanics, Time, and more. He has illustrated postage stamps, movie posters, paperback covers, as well as over 35 children's books. This volume is a retrospective drawn from more than 80 years behind the brush. UPDATED EDITION! This spectacular new book explores the life and work of Reynold Brown, one of the greatest movie poster artists in Hollywood history. This whopping 304 page new edition adds 80 new pages to the original 2009 edition, and is loaded with stunning illustrations reproduced from vintage movie posters, photos, and the original paintings and drawings. This is a stunning document of Reynold's work, and features images from every facet of his long career. This beautiful new book explores the life and work of Harry Anderson, one of America's greatest illustrators. His buttery style in the difficult medium of opaque watercolor has been admired by generations of artists. Now you can examine over 300 stunning illustrations reproduced from vintage magazines, family photos, and original paintings drawn from the Anderson family's archives. This is an essential and comprehensive document of the artist's work. This spectacular new book explores the life and work of Edwin Georgi, the master of eye-popping kaleidoscopic color, and a skilfull renderer of beautiful women. Loaded with stunning illustrations reproduced from vintage magazines, family photos, and original paintings and drawings drawn from the Georgi family's archives, this is a stunning document of the artist's work, and is a must for anyone who loves impressionistic color combined with masterful draftsmanship. For over 30 years, Coby Whitmore's elegant and fasionable illustrations graced the pages of almost every major American magazine. Sophisticated, with imaginative compositions, brilliant use of color, superb draftsmanship, and good taste, his pictures represented the "Good Life." They were also notable for their glamorous women. Of all of the "boy/girl" artists working in those days, none were more admired or imitated than Coby Whitmore. This sumptuous new volume presents over 300 illustrations. In this issue: We feature the work of ELBERT McGRAN JACKSON, best known for his slick magazine illustrations and covers for Collier's, the Saturday Evening Post, and more. Next up we feature MARIO COOPER well known for his watercolor illustrations for the Post, American Weekly, Collier's and much more. Our final feature is the conclusion to our three-part series on the artists of the Old West. Book reviews, exhibitions and events, and more round out the issue. Tom Lovell is widely known today for his Western and fine art work, and previous books on the artist have focused almost exclusively on this side of his career. This spectacular new book branches out in a new direction to explore the artist's earlier days as an illustrator. Featuring over 270 illustrations, this 224 page long volume is filled with beautiful illustrations reproduced from the original paintings, as well as scores of rarely seen tear sheets from the pulps, the slicks, and beyond. PRE-ORDER FOR SHIPPING IN AUGUST 2019! This is the consummate reference book on the life of pulp, paperback, and men's adventure magazine artist Rafael DeSoto. 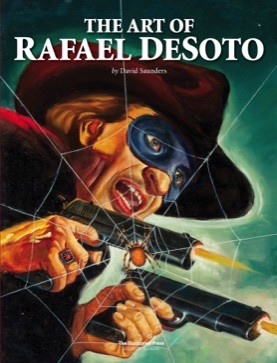 This book contains scores of reproductions taken directly from DeSoto's original paintings, as well as working drawings, reference photos, rare proof sheets of pulp and paperback covers, as well as historic family photos. Limited to just 1000 total copies.